Perform a signal timing and coordination study to examine the existing signal system to determine if the system is oversaturated. Examine improvements to delay from improved signal timing for the existing signals as well as from adaptive signal controls and the cost/benefit ratio of alternatives. Improvements to the signal system on US 42 will result in more efficient use of the existing roadway network. Additional throughput of vehicles on this section of roadway will improve access to the school and commercial properties located along the corridor. Adaptive signal controls allow the traffic signal to automatically adjust to unexpected changes in traffic conditions. If used appropriately, this technology has the potential to improve capacity and reduce crashes. The project provides the opportunity to investigate adaptive traffic signal controls as a solution to congestion along the roadway. This would be the first use of adaptive signal controls on a state maintained roadway in Kentucky. The City of Florence has an active project to install adaptive signals along Mall Road. If adaptive signal controls are installed on US 42, the two signal systems could work together to improve mobility along both corridors. Although adaptive traffic signal controls have the potential to optimize corridor throughput, they do not add capacity to the roadway network. Benefits will not be realized if the network is truly oversaturated. The traffic study will analyze the volume to capacity ratio to determine if adaptive signal controls is the appropriate solution to address US 42 congestion. There are several adaptive signal control vendors that offer varying benefits. The study should evaluate the type of adaptive signal control package that will work best for Boone County and the Kentucky Transportation Cabinet. Adaptive signals require staff and a budget to operate and maintain. There is severe congestion along the US 42 corridor from KY 237 to Ewing Boulevard. Additionally, the volume of traffic is expected to increase approximately 10,000 vehicles per day through the 2040 planning horizon. Land use adjacent to the US 42 corridor is primarily commercial. However, there are several residential developments beyond the project limits that depend upon the corridor. The crash rate along the US 42 corridor is 73 percent higher than the statewide average of similar roadways. There are sidewalks along both sides of US 42 through much of the project area. However, there is a gap in pedestrian facilities across the I-71/75 interchange, between Lacresta Drive and Fantasy Frontier Drive. 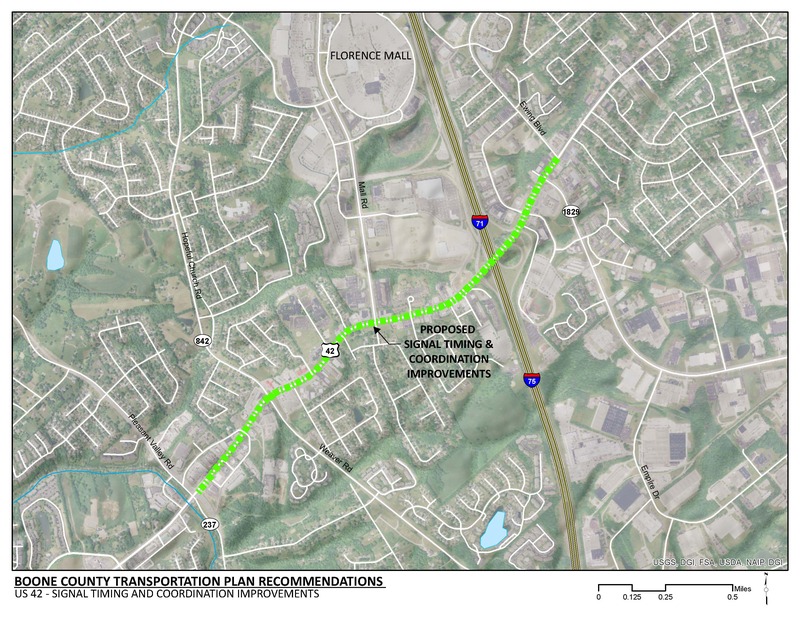 The TANK Florence Transit Hub is located off of Mall Road approximate 0.6 miles north of the US 42 intersection. TANK route 1 runs along US 42 from Mall Road to KY 842 (Industrial Road). TANK route 35x runs along US 42 from Mall Road through the northern limits of the project area.